If all the crazy user interface zooming in-and-out effects of iOS 12, iOS 11, iOS 10, iOS 9, iOS 8, & iOS 7 aren’t your cup of tea, you will be thrilled to discover there is an alternate subdued option available now which transforms the zoom effects into much more subtle fading transitions. 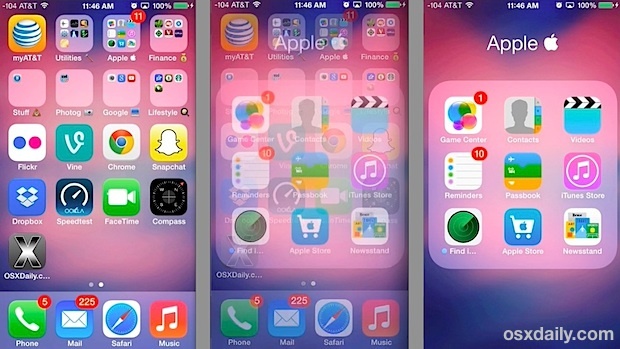 This excellent option was introduced with iOS 7.0.3 in response to some usability issues, where certain users were experiencing motion sickness from the nonstop zoom motions that are seen when unlocking a device and opening and closing apps and folders. The result is a very well done fade transition that looks excellent, and even if you didn’t encounter nausea from the zooming around, you may prefer the fading transitions anyway, because they also make things feel much faster. The effects are almost impossible to capture with screen shots, though the image up top does show the middle frame frozen in the midst of a fading transition. The brief video below demonstrates turning this feature on, as well as the default zoom effects before and the new fading effects after the setting has been toggled on. By no means does toggling this setting reduce the appearance of iOS, and some would argue that it makes things look better. iPad users will probably notice the biggest change with this simply because of the larger screen sizes, but the effect is the same on the iPhone and iPod touch as well. The difference is substantial, thus this trick should remain high on the list of usability tips to improve the overall experience of iOS after the 7.0 release, regardless of the device in use. Other than introducing a nice fading transition, this trick appears to make various user elements feel faster, though that could just be a result of a quicker UI transition. Nonetheless, we would definitely include this on the list of things to do for speeding up iOS 7 (and later versions too) if you feel like it’s running slower than it should be on your iPhone, iPad, or iPod touch. By the way, if toggling this switch does not enable the fading transitions on your device, you probably haven’t downloaded the latest version of iOS or updated yet. 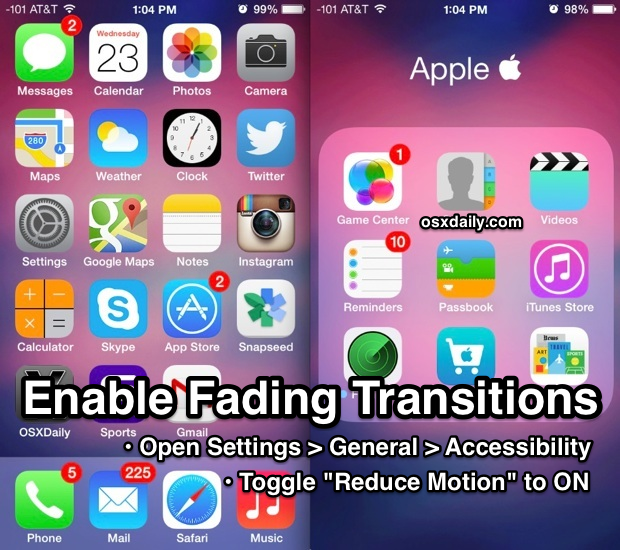 Do that first to be able to gain the new transition effects. I installed iOS9 on my iPhone6 and my iPad Air on 16 Sep., I have not had any problems. I like it. The transition effect didn’t work on my iPhone. And it has the latest update. Thanks! My friends wouldn’t tell me how to do it so I decided just to look it up. Thank you!!!! 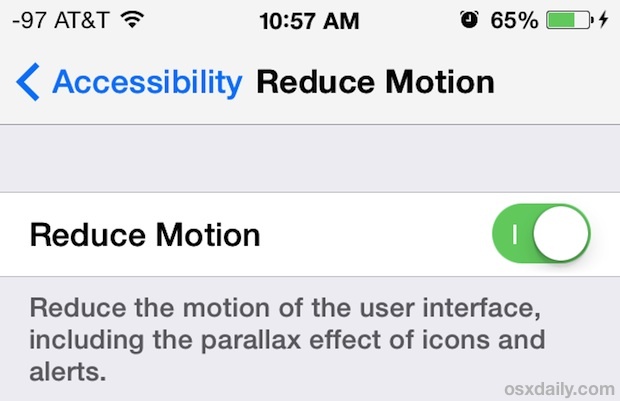 I was going cross-eyed and getting motion sickness….I can use my iPhone again!